Legendary engine builder Maurice Petty (left) was ushered into the NASCAR Hall of Fame by his brother, Richard Petty (right). NASCAR feted four champions and a superstar who left the sport prematurely. Tim Flock, Jack Ingram, Dale Jarrett, Maurice Petty and Fireball Roberts were inducted into the NASCAR Hall of Fame on Wednesday night. Flock won the 1952 and 1955 Cup titles and had 39 wins in 187 starts. The native of Fort Payne, Ala., was named one NASCAR’s 50 Greatest Drivers. His 18 wins in 1955 were the single-season record until Richard Petty topped the feat with 27 victories in 1967. Still, Flock remains the only driver to sweep all three divisions — Strictly Stock, convertible and modified stock — on the Daytona Beach & Road Course. His widow, Frances, reflected on her husband’s career and his infamous "co-pilot." "I bet my darling and all the passed drivers are having one huge race up in heaven tonight," Flock said. "I can almost hear them, telling them stories, especially Tim telling the story about Jocko. Jocko was Tim’s co-pilot. He was a Rhesus monkey that was by Tim’s side in all the races, eight races. Everyone loved Jocko. But one day in 1953, at Raleigh, N.C., Jocko got loose, and Tim had to pull in the pits to put Jocko out, the monkey out of the car. "He came in third that day, and the extra pit stop to remove Jocko from the car cost him a big sum of money that day. His brother finally went on to win the race, and Tim retired from racing in 1961, but he loved racing so much that he went on to work at the Charlotte Motor Speedway. He spent the next 37 years doing what he loved, being a part of NASCAR." Jack Ingram earned five titles between the Late Model Sportsman (3) and NASCAR Busch Series (2). The 77-year-old native of Asheville, N.C., held the Nationwide Series record for most wins (31) until Mark Martin surpassed the total in 1997. The "Ironman" amassed 317 NASCAR wins and 12 track championships during his time behind the wheel. "This is a major lifetime achievement for me," said Ingram, after he was inducted by Harry Gant. "While I’ve won driving the car, I had plenty of help and support along the way. Otherwise, I wouldn’t be here tonight. I would like to thank my family, my dear wife, Aline. She was my rock, always there in late nights, early mornings, throughout the good and bad, and I cannot express how thankful I am to her." Ingram was grateful to the NASCAR fans and credited the 1975 Daytona 500 on Wide World of Sports for putting him on the map. "I started getting them letters from everywhere," Ingram said. "We still got them. They’d write a letter would be to Jack Ingram, Asheville USA, and I’d get it. I bet a lot of them I didn’t get. You wouldn’t get any of them today. That was really something that made my whole racing career. Thankful to people all over that enjoyed NASCAR racing." 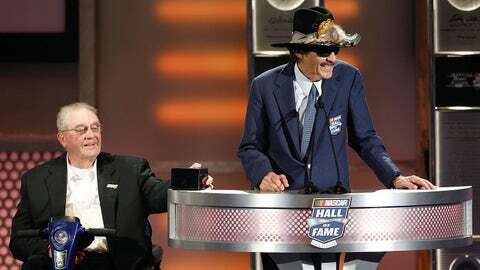 Not surprisingly, Richard Petty inducted his brother, Maurice, into the NASCAR Hall of Fame. As the first engine builder elected to the Hall, Maurice powered Petty cars to seven titles and more than 200 races, including seven Daytona 500s. "It’s an honor and a privilege for me to be inducted into the NASCAR Hall of Fame," Petty said. "Who would have thought growing up that there would be guys, four of us, out of a small, rural country community that would be in a North Carolina Hall of Fame? "I want to thank my wife, Patricia, for taking care of the children, looking after them, taking care of the home, paying all the bills, and supporting me, allowing me to work and accomplish the things that I did. I want to thank all the people who worked for Lee, Richard and me at Petty Enterprises, including Dale Inman. We were one of the most successful teams in NASCAR history." Affectionately known as "Chief," Petty shared the distinction as the second of four father-son inductees in the ceremony, along with his father, Lee, and brother, Richard. Dale Jarrett also joined his father, Ned, in the Hall following his induction in the Class of 2014. Unlike the other honorees, Jarrett is well-known to present day race fans through his contributions in the ESPN booth. Before his second career, Jarrett won the 1999 Cup title along with netting 32 career wins. "I am honored that many of you could join me here tonight, and just know that if we worked together during my 31 years of driving or the last six years in the world of television, I have thought about you and appreciate the opportunity we had to work together," Jarrett said. "Your efforts and sacrifices are really the reason I’m here tonight. "I had the opportunity to race with some of the greatest drivers in our sport’s history — Petty, Pearson, Allison, Waltrip, Earnhardt, Wallace, Gordon and Johnson, just to name a few, and I stand here tonight feeling as though I’m the luckiest person on earth." Edward Glenn Roberts Jr. earned the name "Fireball" long before he found success in racing. During the 15 seasons that Roberts competed in NASCAR’s premier series, he won 33 races in 207 starts. Although he never completed a full season, Roberts finished in the top five in the points standings three times, including second in 1950. Roberts grew up in Daytona Beach and enjoyed tremendous success on his hometown track, where he won seven times. Roberts’ grandson, Matt McDaniel, accepted the honor on his late grandfather’s behalf. "We are proud that our grandfather, who sacrificed his life to racing, is being honored by NASCAR, the organization that set the scene for a life well-lived," McDaniel said. "During the 1964 World 600 at Charlotte Motor Speedway, he was involved in an accident that would ultimately claim his life, as well as change the sport he loved. "After his death, NASCAR started developing flame-retardant coveralls, five-point safety harnesses, special contoured seats and a fire zone fuel cell. There is no doubt that our grandfather would have shared this special night with everyone who influenced and had an impact on him during his career, including his family, friends, colleagues and fans." Chris Economaki posthumously received the Squier-Hall Award for NASCAR Media Excellence. Economaki earned the moniker "Dean of American Motorsports" for his journalistic contribution to the motorsports spanning more than 50 years.